It has moved about quite a bit from an initial home at Wembley, a tenure at Islington, then the unpopular Olympia, and now for the last four years Earls Court, where we are told it will be sited in 2013 too. 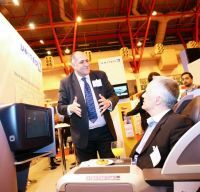 The 2012, Business Travel Show, organised by Centaur Exhibitions last week, attracted 197 exhibitors, a figure up from 134 in 2011, although one suspects that the new Business Travel Technology Zone contributed to increased numbers. Pre-audited visitor figures of 6,300 represent an increase of 27% on last year but missing was British Airways, due to budget cuts it was explained, some sort of statement perhaps, and noted by many. 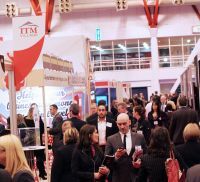 The hall had a buzz about it at all times, the new hosted buyers programme clearly a success. On the airline front Virgin Atlantic once again dominated the show entrance. A rampant United Airlines was much in evidence. The Continental brand has gone but the faces (and logo) remain the same. Rumour has it that the final (reservation system) cutover will be the first weekend in March but it does very much depend on weather (it can be very snowy in the US at that time of year), and the technicalities. It is the Continental system that is being used. Star Alliance offered hospitality to visitors with the usual First Class lounge. Aurigny and Flybe also kept the UK flag flying and Finnair was very busy promoting its Far Eastern connections via Helsinki from Heathrow and Manchester. Also with their own stands were Egyptair and TAM. The airline pavilion concept, a small group of airlines around a central meeting area, also proved successful bringing together Air Astana, Air Berlin, Arik, Japan Airlines, Malaysia, MEA, Oman, SAA, Ukraine and Vietnam Airlines. New at the show, and yet to take off from London (8 March Gatwick), was Hong Kong Airlines. Whilst we await to see the actual product, the concept is unique and very exciting. A two-class Airbus A330 will fly with what is suggested will be a very superior 1+2+1 ‘Club Premier’ Class of 34 flat-bed seats and chauffer car service, whilst ‘Club Classic’ offers 82 cradle seats with a 51” pitch. Just 116 seats. All passengers will have full lounge facilities (No 1 Traveller in the North Terminal) and are promised excellent cuisine. Everyone (who wants it) gets free wireless. The airline was emphasising its 16 Chinese mainland connections, and forward travel to other Far Eastern destinations. It offers the only direct flight from Gatwick with its own catchment area, to Hong Kong (four airlines compete out of Heathrow). Operating Business Class only long haul flights can be tricky, ask Lufthansa, but with the right aircraft it can work. Singapore Airlines is a success from Changi to New York and Los Angeles. 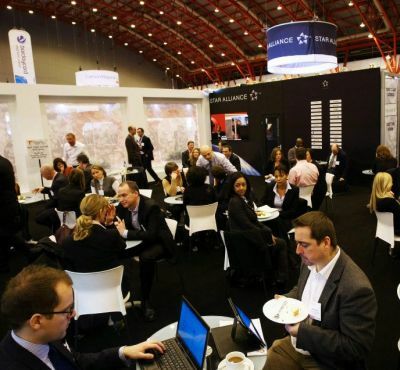 For the most part the major hotel groups, with the exception of Hilton Worldwide, kept away from Earls Court, although senior executives could be seen around, clearly keeping an eye on the proceedings. Wyndham, who claim to be the largest operator when it comes to rooms, did have a smallish stand. The largest budget hotel prominence was clearly Premier Inn with Travelodge a close second. Best Western was also represented but with much less stand space. Taking part in the show for the first time was London’s Queen Elizabeth II Conference Centre. Serviced apartments is another rapidly growing part of the business travel and relocation industry, a significant increase in participation noted from last year. Other than a splendid meeting and networking event, which has always been the case, the main business over the two days is always the conference programme, all free and this year divided into Panel Debates, Case Studies and Masterclasses. Aimed at complete opposites were “The Bookers Workshops” and “Buyers Workshops”. All in all over 50 sessions were on offer with few clashes this year. The Business Technology Zone had its own programme, which hovered between the simplistic and the highly digitised, a difficult bridge to cross. Either it was too simple or impossible to understand.